Debbie (left) and John Dingell relax at home in Dearborn in 2014. 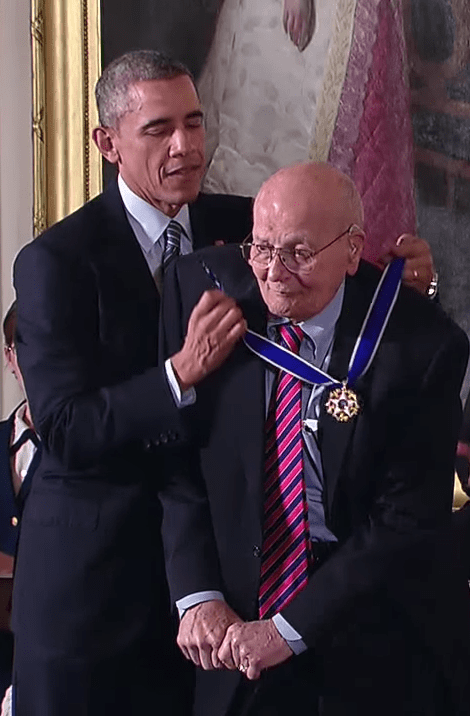 U.S. Rep. John Dingell receives the Presidential Medal of Freedom, one of the three highest civilian awards in the United States, from President Barack Obama on Nov. 24, 2014, at the White House. DEARBORN — Former U.S. Rep. John Dingell, the longest serving member of Congress ever, died Feb. 7 at the age of 92, his wife, U.S. Rep. Debbie Dingell (D-Dearborn), announced. “It is with a heavy heart that we announce the passing of John David Dingell, Jr., former Michigan congressman and longest-serving member of the United States Congress,” a statement from Debbie Dingell’s office read. “Congressman Dingell died peacefully today at his home in Dearborn, surrounded by his wife, Deborah. On Feb. 6 news that John Dingell had been receiving hospice care was confirmed to the AP by a source close to the family. The person was not authorized to speak publicly, but informed the news outlet of Dingell’s condition, according to the AP. Multiple other news outlets additionally reported that Dingell had chosen not to get treatment for his prostate cancer that has metastasized. That same day, Debbie Dingell shared a message on her Facebook page regarding her husband’s health and her absence from President Donald Trump’s State of the Union address. Visitation will be held from 11 a.m. to 8 p.m. Feb.11 at the Ford Community & Performing Arts Center, 15801 Michigan Ave.; and a funeral mass will be held at 11 a.m. Feb. 12 at Church of the Divine Child, 1055 N. Silvery Lane. A World War II veteran, he will be interred at Arlington National Cemetery. John Dingell had recently faced a number of health issues and hospital visits, including a minimally invasive heart procedure in March 2014, a hairline hip fracture in December 2014, a heart procedure in October 2015, and a small heart attack last September. President Lyndon Johnson (right) gives U.S. Rep. John Dingell a pen used to sign legislation. He took office on Dec. 13, 1955, following a special election for the seat representing the 15th District of Michigan. The seat had formerly been held by John Dingell’s father, John D. Dingell Sr., who represented the district from 1933 until his death in 1955. Since then, John Dingell was re-elected 29 times despite the re-drawing of district lines several times over the years. Redistricting in the 1960s changed Dingell’s district to the 16th which included Dearborn and all of Downriver and Monroe County. That district was eliminated after the 2000 census, and redistricting put Dingell in the 12th District. He was last victorious in the November 2012 elections where he won the seat representing Michigan’s 12th District. On June 7, 2013, he became the longest-serving member of Congress in U.S. history. At 57 years, 5 months and 26 days, he passed the previous mark set by Sen. Robert Byrd (D-W. Va.). Dingell was already the longest-serving member of the House, a feat he attained in February 2009. He retired at the end of 2014, with Debbie Dingell succeeding him after she won the 12th District House seat during the November 2014 general election. In November 2014, John Dingell received the Presidential Medal of Freedom, the highest civilian award, from former President Barack Obama. The city of Dearborn opened the John D. Dingell Transit Center, 21201 Michigan Ave., in December 2014 dedicated in the honor of Dingell, who was an essential advocate for the completion of the center, according to the city’s website. John Dingell sat on all six subcommittees of the House Energy and Commerce Committee and was also chairman of that committee from 1981 to 1995 and again from 2007 to 2009. In an interview leading up to his retirement in 2014, John Dingell said he was glad steps were taken while he was in office to make health care a right, not a privilege, a goal in which his father strongly believed. He said massive changes in health care occurred because of Social Security, Medicare, Medicaid, and the Affordable Care Act. “Too many people in this country die for want of health care,” he said. “Too many people were denied coverage based on pre-existing conditions or the profit margins of a billion dollar industry. While he is proud of the change in health care, Dingell said he was most proud to cast his votes for the Civil Rights and Voting Rights acts. He said one of the most difficult decisions he ever had to make as a legislator was to send people to war. He said he regrets voting for the Gulf of Tonkin Resolution that led the U.S. into the Vietnam War.